Are you looking for a leadfree .22 long rifle round? 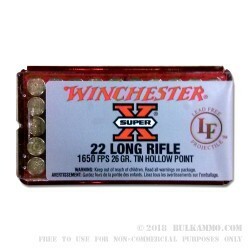 The Winchester Super-X .22 long rifle solid tin hollow point is an ideal ammunition for a hunt in a leadfree region or a trip to the range. This 26-grain solid tin hollow point flies at 1650 FPS and is a great round for target practice, varmint hunting or shooting at soda cans with the family. First produced in 1922, Super-X has delivered dependable performance for generations. These Winchester rimfire primed brass rounds come 50 rounds per box. For 150 years, the name Winchester has been synonymous with American quality, reliability and ingenuity. Using only the highest quality components and state of the art manufacturing processes, Winchester produces some of the world’s best ammunition and some of its most iconic firearms.